Hombre is a rodenticide that contains the lowest concentration of the newest active ingredient! Hombre is for interior use only. 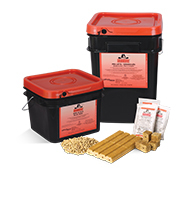 Before placing bait, eliminate as much of the naturally occurring food as possible. Place bait in locations where rats and mice travel and will most likely find and consume the bait. Hombre must be placed in tamper-resistant bait stations or in locations not accessible to children, pets, livestock, and non-target wildlife.